The TOGAF enterprise architecture framework is one of the world’s leading standards for enterprise architecture. Regular updates have kept it fresh and relevant - so, what has changed with TOGAF 9.2? Visit Good e-Learning today to achieve your fully up to date TOGAF certification! For more than 25 years, The Open Group has kept the TOGAF Enterprise Architecture framework cutting-edge with regular updates. When TOGAF 9.2 was announced in April 2018, practitioners and students were eager to find out about how the framework would be improved, and what it would mean for existing certifications. 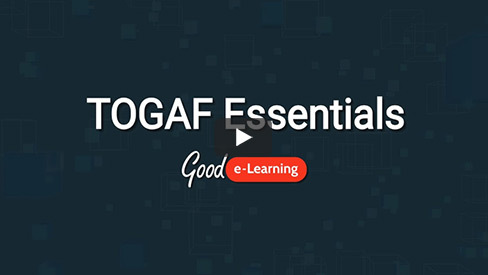 In this video, Mike of Good e-Learning takes a look at the updates introduced to TOGAF with Version 9.2. With changes made to the Architectural Development Method (ADM), a greater overall focus on business and security, the introduction of the TOGAF Library and more, the framework has seen a number of key improvements - but what exactly do students and TOGAF practitioners need to know? Are you interested in gaining a TOGAF 9.2 Certification? Do you want to update an existing certification by studying the Essentials of TOGAF 9.2? Good e-Learning is an award-winning online course provider for the TOGAF framework, with a portfolio that has been fully accredited by The Open Group.